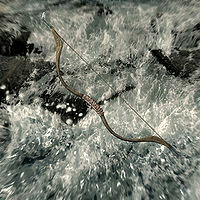 If you interact positively with Angi and complete her archery challenges, she will give you the bow as a sign of her gratitude, and to rid herself of the artifact of her late relatives: "Thanks for sticking around and keeping me company. It was nice to finally meet someone out here who doesn't want to rob you or take off your head. I know it isn't much, but here, take this bow. It was given to me by my family. It's special to me, but brings back too many painful memories."